Everyone’s décor is unique. We offer these tips in selection, but they are not a must in selecting. Metal stools are often used and are usually clean lines – straight or slightly flared legs and with no decorative, curly (ornate) designs. The backs can be simple, squared, or rounded. Wood can be a nice choice, however; if they also have clean lines. Country is usually antique or distressed finishes appearing to be a bit aged or simply painted or stained in a two-toned finish (seat one color, backs and legs another). Arrow Back, Windsor, Sheaf and Ladderback stools are commonly used and can be all one color as well as two-toned. The legs are typically carved and seats can be padded or wood. Windsor backs can be spindled (rounded, straight, or curved posts), or slats (flat and with an arrow shape at the tips with a rounded back called bow backs). These stools tend to look a bit country, but can have ornate designs and also look a bit aged. In metal stools, the finishes are usually not one solid paint color, but an antiqued finish, in example: brown with mixed black. They can have flared or curled legs or backs, rounded seats vs square seats. Wood stools can have napoleon styled backs, sheaf or ladderbacks, and can also have distressed finishes. Traditional stools tend to be wood with padded seats and can have a slight flare to the backs. Queen Anne, English Styles are commonly used and a traditional look has a somewhat formal look to it. Dressier fabrics and deeper wood tones are popular, however; metal stools can also be used. Knotty pines, mission with a rustic touch are generally popular choices. Knots are visible in the woods with basic, simple, square lines, thick legs and usually a bit heavier look to them. Wood can be distressed and stains are usually medium to dark colors. They are usually chrome with bright color seats: reds, aquas, pinks, yellows, whites, and blacks. This style signifies the 50s era with speckled Formica’s or common black and white laminate tops. Stools are usually vinyl upholstered and come with backs or no backs. The legs are round, tubed, metal with a round tubing on the backs and can have a separate color of cording around the seats and backs. These can have metal studs along the seats or backs and sometimes have arms and have a larger look to them. This style tends to show a more conservative look with darker wood stains and leathers. Queen Anne furniture can be recognized by a Cabriole leg. The carving is used simple and in low relief. Mahogany is widely used and with a lacker high shine or medium shine finish. The scalloped-shell design is a common used decoration. Some styles for the legs are the claw and ball and the dutch foot. Queen Anne can fit well with contemporary or 18th Century walnut pieces or traditional. Carving, turning, brass inlay, wood and mother of pearl are typical with this design. Some favorite designs are scrolls, flowers, leaves. 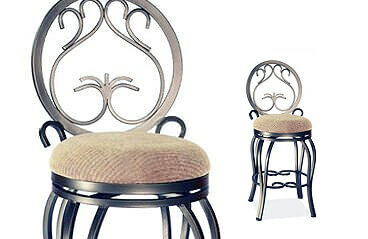 Characteristic backs on stools are oval shaped or horseshoe shaped and seats usually upholstered. Some have tufting with buttons and seats can be round or oval. Feet has simple, scrolled curves or are flared. Counter and bar stools tend to have banister backs, ladder-backs and even Windsor style backs. Seats are solid wood, leather and rush. The legs can be simple turning and shaping.